The item Coriander the contrary hen represents a specific, individual, material embodiment of a distinct intellectual or artistic creation found in Evansville Vanderburgh Public Library. 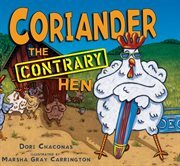 Coriander is a contrary, stubborn hen, with a mind of her own. When she decides to plant herself in the middle of the road causing a chaotic traffic jam of cars, trucks, and buses, Farmer Bucket and Mrs. Bucket can't get Coriander to budge. Little Fanny Bucket finally uses a bit of reverse psychology to get her way. But will Coriander have the last laugh?